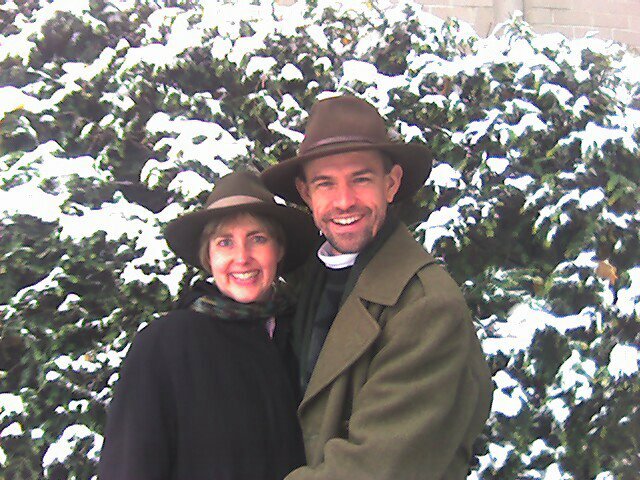 Joyce and I have created a Christmas gift for you. The gal playing the flute is Bonnie Doyle, a MasterWorks alumna. She's now a pro! 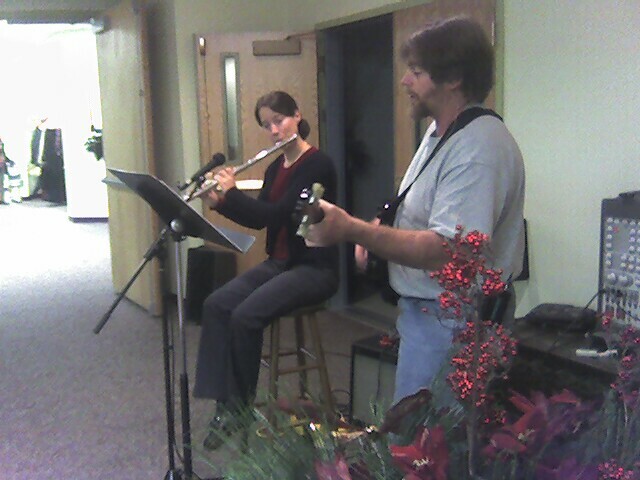 Mike Lewis joined her on guitar, playing Christmas Carols as people came in for my performance of Views of the Manger a couple of weeks ago at Grace Community Baptist Church. I was able to review the response cards we received after our Friday and Saturday night shows, and I’m excited to tell you that we got 14 cards that had the “I rededicated my life to Christ today” box checked, and 13 of the “I prayed to personally accept Jesus as my Savior today” box, so that’s totally exciting! I don't think this included one woman who prayed with the pastor to receive the Lord long after they stopped collecting the cards. The octogenarian's family had been praying and fasting for years for her salvation. 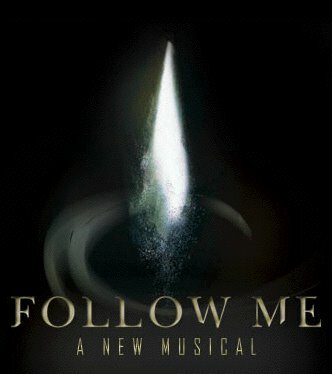 David Lander, who will be lighting both plays in our Off-Broadway run, invited Joyce and I to see Follow Me, a modern musical telling the Christmas story. His associate, Stephen Arnold, designed the lights. Turns out one of the co-creators is Michael Capecci, who co-produced Schoolhouse Rock Live! when I was on staff at The Lamb's Church. The live rendition of the Saturday morning classic had quite a run in the downstairs Lamb's Theatre. He's done a fine job with Follow Me. There are two shows left. See it if you can. 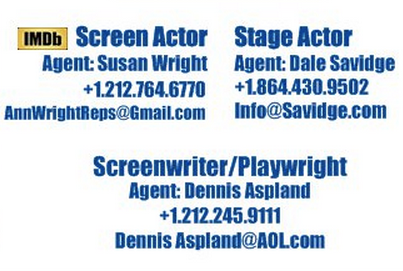 Things are lining up well for our Off-Broadway "run" of Beyond the Chariots. Roger Nelson, who's renting Theatre 315 with me, just sent his Journal of John Wesley mailing out to a few thousand folks. Please pray that they arrive without mishap and that many will give generously toward our endeavor to reach the Broadway community with the Gospel. You can download of PDF of the Journal by clicking here. You'll notice that Roger is offering his subscribers a free ticket for every donation of $50 or more. I'd like to offer the same. Also, if you prefer, I'd like to send you a DVD of Changing Lives: The Peter Cooper Story, a 15-minute documentary for which I performed the voice of Peter Cooper. PBS is interested in airing a longer version. We hope you'll partner with us in this ministry endeavor. Both plays articulate the Gospel clearly and dramatically. To make a tax-deductible donation and receive a thank you gift, click here. 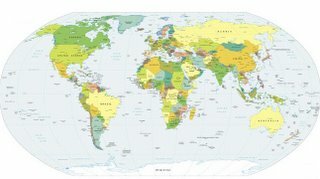 Monthly Reminder: My itinerary can always be found at RichDrama.com/Itinerary. Our pastor, Jim Warren, who used to be Creative Director at MTV, spearheaded the creation of a replica of the Ark of the Covenant. It's about to be uncovered. 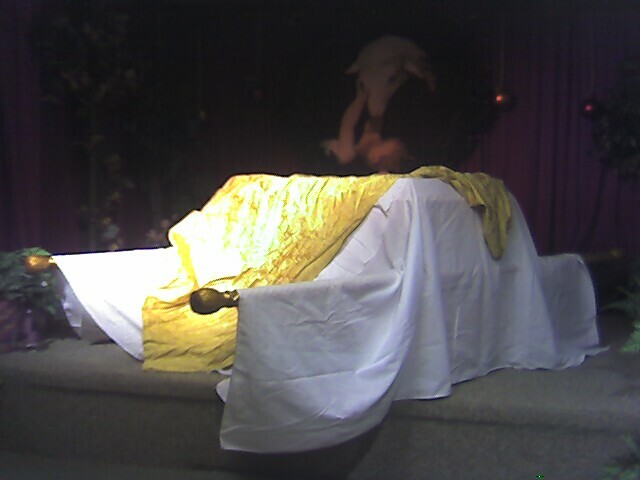 My next play will be about the Covenant, and the Ark will be a part of that production. For now, we're going to have manna, prepared for us by our own James "Moses" Rath, a VP at Tom Cat Bakery. Now I'm going to get back to the credits. 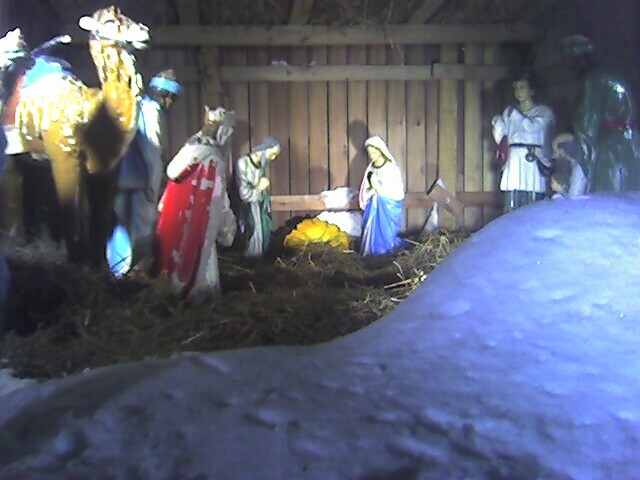 The blizzard dumped about a foot of snow on us here in Washingtonville, NY, but the sun came out around noon, and the roads were clear enough that about 400 made it out to see Views of the Manger. After the play Pastor Terryl of Grace Community Baptist Church summed it all up by saying that Jesus is a hitchhiker. 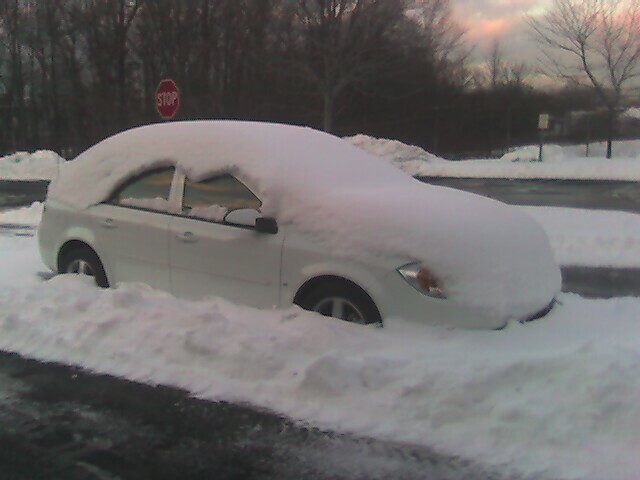 Some of us drive on by. Others pick him up and engage in some dialogue. And then there are those of us who let him take the wheel. He invited people to do that tonight, and eight people went away with a little book called 10 First Steps for a New Christian ! No Christmas gift could top that for me, but tomorrow night they're sold out. Pray with me that more will be sold out for Jesus. This time I didn't cry onstage, which was good. "Jesus wept" isn't associated with his reading from Isaiah 61, which I was performing: "The Spirit of the Lord is on me..."
This time I was backstage. I went there at the end of communion so I could partake without making myself rushed as I was getting into costume. So I was putting Christ on as I was taking Him in. As I realized the juxtaposition I was overwhelmed. In the moment I prayed for that kind of connection during devotions. I pray it again now. 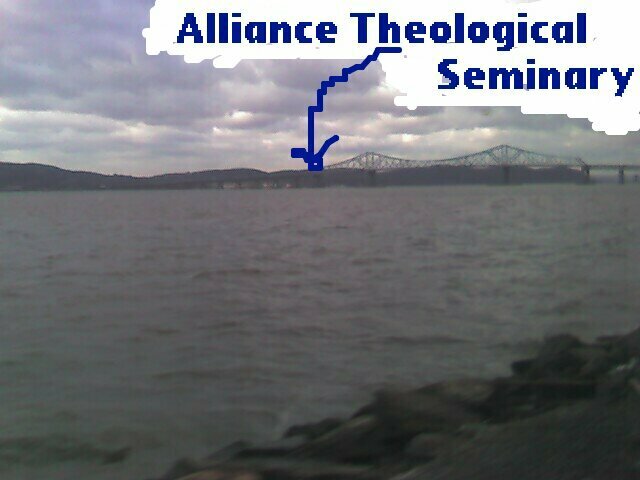 I just performed my Christmas play, Views of the Manger, for the first time this Season at Alliance Theological Seminary, just across the Hudson. Joyce earned her Masters there, though most of her credits were at their Manhattan campus. Because I've been so focused on prepping for BEYOND THE CHARIOTS' Off-Broadway run I'm afraid my rehearsals have been just about making sure my lines and blocking are solid. Well this morning all the weight and wonder of Christmas gave me a solid whack in the head right in the middle of my performance. Now this happens every year: the fresh realization that the Creator of the Universe came to earth in the hay and slobber of work animals to the poorest of parents, thought by most to be moral reprobates. I always bawl like a baby when it finally hits me...every year. This year it happened on stage, and Harvey the Innkeeper was a blubbering idiot! I was a huge Mork and Mindy fan when I was growing up, and I was tickled to see that a boy named Mork is available for sponsorship through Compassion. To sponsor Mork, click HERE. If he's not there, someone said, "Nanoo nanoo," before you did, but there are plenty of other terrific kids who will think you're out of this world if you sponsor them.